In recent years New Zealand’s news media has taken a bit of a hiding. Sure, people aren’t consuming news like they used to – Papers are still read, but web-based news is being read more. People still listen to the radio – But what used to be interactive “news” and “talkback” has devolved into getting the most sensationalist sound-bite (the audio version of “click-baiting”) and “commentators” (rather than “journalists”) blurting their unqualified opinions over top of experts and members of the public who have been actively encouraged to “join the debate”. Even those supposedly at the helm of New Zealand’s handful of television networks seem hell-bent on steering the nation away from the calm, measured waters of current affairs and investigative journalism and running what is left at flank speed onto the rocks of rotten hyper-reality television. It’s very grim stuff if all you want is informed discussion and the truth. Even my local paper – the Hawke’s Bay Today doesn’t appear immune to lessening standards. In June this article aroused both my interest and ire when it appeared on Hawke’s Bay Today’s website. Being familiar with most Hawke’s Bay reporters and not recognising the name of this article’s author I clicked on the link to learn more. It turned out this wasn’t a local article at all. The author appears specialises in commercial real estate articles around New Zealand. Essentially this was a real estate advertisement masquerading as news. “The retail centre of Taradale is about 1.5 kilometres away, so a new neighbourhood café here would have a virtually unrivalled trade catchment area. There is no other real local alternative for grabbing a barista-made flat white and a plate of eggs benedict. This article was followed up a couple of weeks later by a counter-piece, this time written by a local reporter, as the proprietor of the Video Ezy store that is part of the building up for sale had to reassure his customers, who were concerned he was in the throes of closing down, that he had no plans to shut up shop, or awareness of the new nature of his reduced lease terms. In August, while Hawke’s Bay’s amalgamation debate was reaching a heated climax, someone at Hawke’s Bay Today chose to allow the pro-amalgamation group, “A Better Hawke’s Bay” to buy a four page wrap-around advertisement on one edition of the paper’s regional and community issues. While the actual front page and rest of the paper was untouched inside this wrap-around, the “faux-front (and back) page” included the paper’s title banner, giving the appearance of an authentic front page and leading some readers to perceive that the paper supported amalgamation. Now let me be clear – Editorially, throughout the amalgamation debate and voting process, Hawke’s Bay Today did indeed maintain a fair balance in giving voice to both the anti and pro-amalgamation sides, so this appears to be a commercial decision. Given the sheer cost of such a large, wrap-around advertisement; it could be very hard to turn down that sort of money. But, as some pointed out, when the paper was doing its best to remain neutral, surely such an advert would have been better suited as an internal lift-out, rather than an audacious wrap-around. Putting this advertisement on the outside damaged people’s perception of the paper’s neutrality and for many perception is reality. Speaking of perception, I thought mine was failing me when I read this article online one morning in July, then happened to read the same article in the print edition the same day. 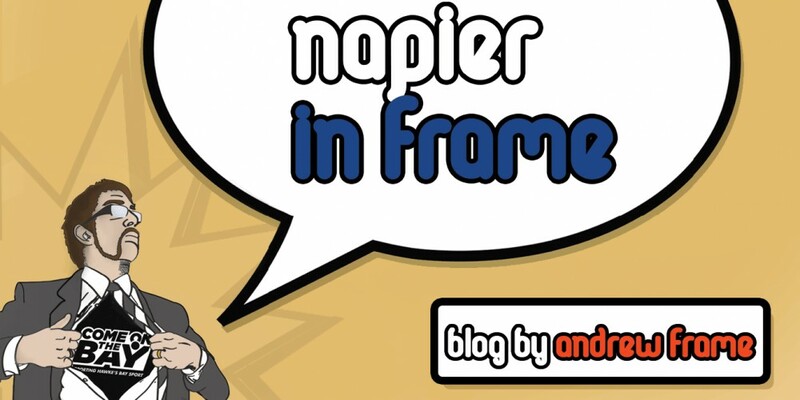 Something was missing – it was Napier’s mayor! The article centres around Ngati Kahungunu chairman, Ngahiwi Tomoana, who is pictured online in a file photo next to the Mayor of Napier, Bill Dalton. But in the version of the photo that went to physical print, Mayor Dalton ceases to exist – he (except for his hands – see the red circle) and the background has been rather badly photo-shopped out. Mr Dalton doesn’t feature in the article’s text, so didn’t need to be in the picture. Why not just crop the photo around Mr Tomoana? Why the bad photo-shop job instead? Given the timing, I thought it might be part of the paper’s neutral amalgamation stance, but that just didn’t stack up – a rather odd move all round. Now given my criticisms above, you may think I don’t like the Hawke’s Bay Today. But you’re wrong – I love it! I love that it gives a voice to Hawke’s Bay’s people, its events and news. I love that our region still has its own printed newspaper over a hundred years after the launch of the Daily Telegraph and Herald Tribune. But like things you care about, your love often has to be “tough love”. When you see it doing something wrong, you need to tell it to change its ways, to help it grow and improve. A better Hawke’s Bay Today! This entry was posted in Hawke's Bay, Media, Opinion, Politics, Social Media, Writing and tagged Business, Hastings, Hawke's Bay, Humour, Media, Napier, Opinion, Politics, Social Media, Twitter, Writing by Andrew Frame. Bookmark the permalink.